We could never tell a lie. 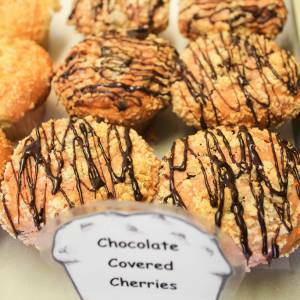 Frank Michaud has chopped down every cherry-tree in sight to make these muffins. Not only that but he’s shamelessly covered said cherries with chocolate. Well, we hope everyone feels better. The truth is in the muffin now. There’s no going back and I guess we’ll just have to take the consequences as they are. We’re now calling the Chocolate Covered Cherry muffins: Truth Muffins. They’re honestly good.